What would happen if we designed new urban megastructures using the latest scientific information about green design? Portland architect Bill Badrick has the answer. The new Columbia River Crossing bridge, in Portland, Oregon, should be a double-decker, carbon-neutral engineering marvel — complete with a huge park on top. The best part? It's all possible with current technology. The park roof will be a tool to capture the rainfall that would otherwise land on the road surface and mix with the oil and gas that falls off of vehicles. Traditionally, stormwater pollution is expensive to treat—pollution treatment facilities cost in the area of 12 to 15 million. In addition to the facility, a conventional bridge roadway must be made to slope to drains, which fill hundreds of pipes that are routed to the treatment plant. All of these metal drains and pipes cost money and add to the carbon footprint of the bridge. By contrast, the park roof would need only a small gauge recycled plastic pipe sprinkler system that can be powered by solar panels. By capturing the rain fall with the park roof, we can save money—and save the salmon. The federal government’s recent studies on green roofs, which had previously been predicted to absorb 75% of rainfall, found that they actually captured nearly 95% of the rainfall. Based on these findings, the park roof will save us a great deal of money and improve the carbon footprint dramatically. The CRC park roof will be about 370,000 square feet, and Portland receives roughly 37.5 inches of rain a year. This amounts to almost 14 million cubic feet of water captured and almost $170,000 saved. From a design perspective, the park roof also promises benefits. The roof will be a curved cap to the bridge, making the bridge a good deal more aerodynamic. This efficient design shape will reduce structural stresses, thus reducing cost. It is likely the savings due to better wind performance will account for the cost of the additional park support frame. Plus, as bridges are engineered to be three times stronger than needed, the additional 23 lbs/sq ft load will be absorbed on the base structure with no additional load cost. It is important to note that the park ‘dirt’ is made of very lightweight engineered growing medium, anchored to a matrix net to make it wind and erosion proof—this is not your grandma’s garden. I look at everything through a 'green' lens. 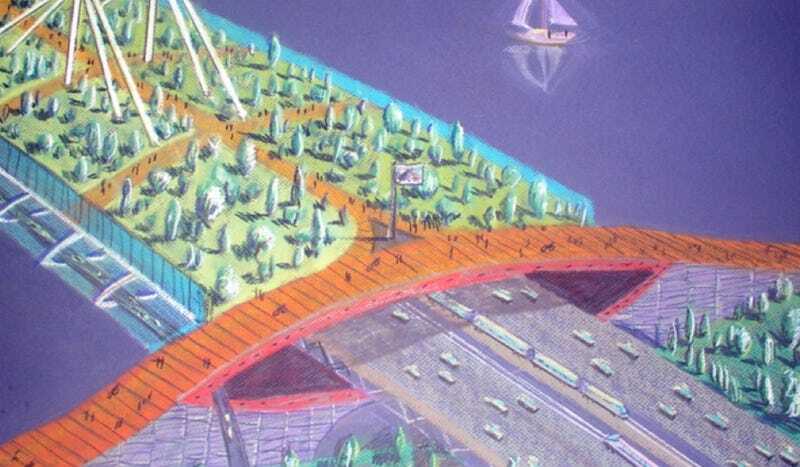 The current official proposal for the bridge has the bike path in the dark under the car decks, and I thought, it should be the opposite, Right? People and bikes and dogs should be on top, up in the sun!